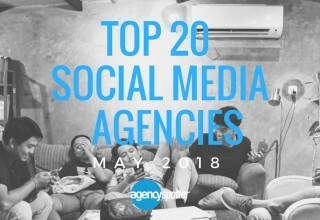 For its latest report, the B2B ratings and review authority evaluated more than 750 social media agencies based on credentials, focus areas, related expertise, verified client reviews, and project work. 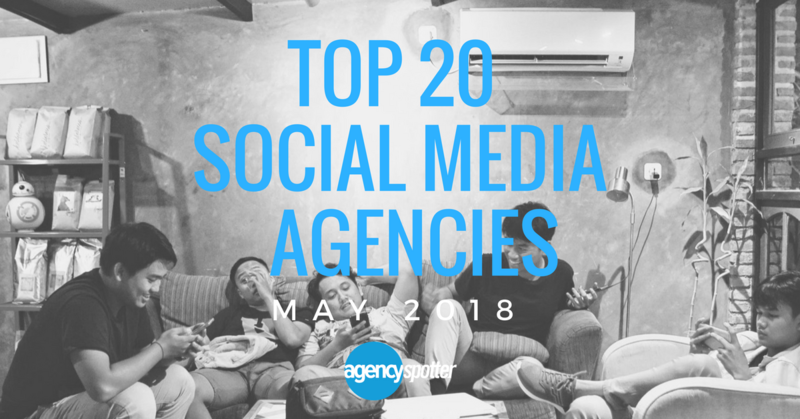 ATLANTA, May 21, 2018	(Newswire.com) - Atlanta-based company Agency Spotter ranked approximately 750 social media agencies this May and chose the New York City-based Bigbuzz Marketing Group as #1 on its first-ever social media marketing agency report. 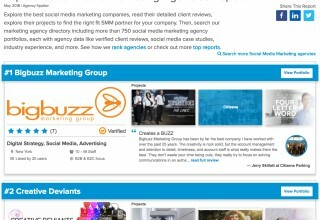 Bigbuzz Marketing Group has worked with companies such as HBO, Honeywell, Nikon, and Disney. Despite the wide industry range of their clientele, Bigbuzz is able to develop “custom roadmaps” for each of their partners to help them successfully navigate the huge amount of channel opportunities available to marketers today. Their strategy is designed to move merchandise and build brands. Bigbuzz’s recent social media campaign for the children’s brand, Garanimals, shows they are able to stay on the cutting edge. Targeting millennial moms via social media, the agency engaged with one of the most important audiences in order to refresh the decades-old brand. Their campaign helped Garanimals become Walmart’s #1 selling clothing brand. Aside from consumer goods, Bigbuzz Marketing Group also specializes in the banking, healthcare, and the food and beverage industries. Number two on the report is the Los Angeles agency Creative Deviants. The agency has worked with companies both large and small, including Volvo, Oakley, Mooney Aircraft, and the Boys & Girls Club. They pride themselves on having achieved success partnering with both established companies and startups that are just planning to launch. The five-star-rated agency does all production in-house, which allows them to “work with their clients’ budgets rather than around them.” Creative Deviants thinks its work speaks for itself, and urges those interested view their online social media marketing portfolio. 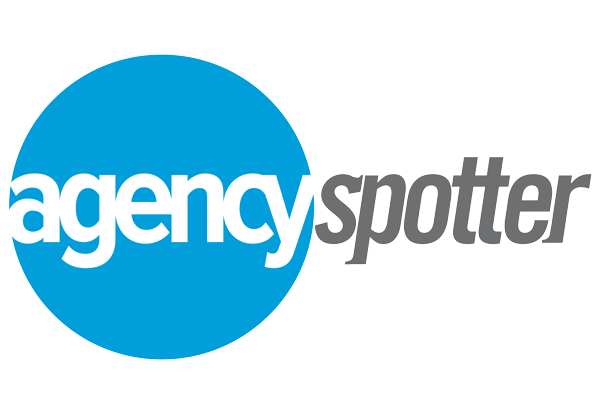 100 percent are based in the U.S.
Agency Spotter’s Top Agency Research Reports are issued on a regular basis and are continuing to roll out across various marketing, advertising, and design service areas. Companies interested in being in the running are encouraged to complete their portfolios or apply to get listed, and to review the report methodology to be evaluated for future coverage. 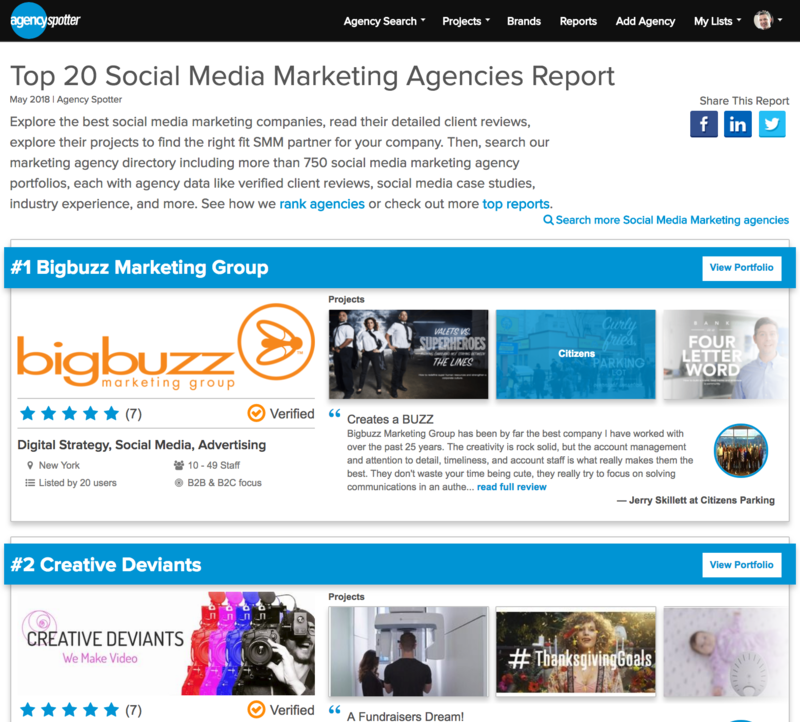 Agency Spotter is a B2B ratings and review marketplace and SaaS provider that connects marketers with top marketing agencies across advertising, design, digital, and 40 marketing related services. The company’s website and iPhone app help professionals navigate the marketing agency landscape and let thousands research and select agency partners around the world. Learn more on www.agencyspotter.com.